Happy Super Bowl week football fans! Even if your favorite team is out for the season, it’s still exciting to get a bunch of people together to watch the big game. In honor of this year’s host city, I’ve created a New Orleans inspired menu fit to feed the crowd during the game. New Orleans cuisine is a combination of French, Cajun, and Creole foods, which means it’s time to heat things up with some Cajun spices! The key to entertaining for the Super Bowl and still enjoying the game, is to have enough of your menu made ahead that you don’t have to spend game time in the kitchen. That means apps are easy and made the day before, dinner is a one pot stop, and dessert can be thrown in the oven during halftime so you can enjoy the sweet rewards in the 4th quarter. 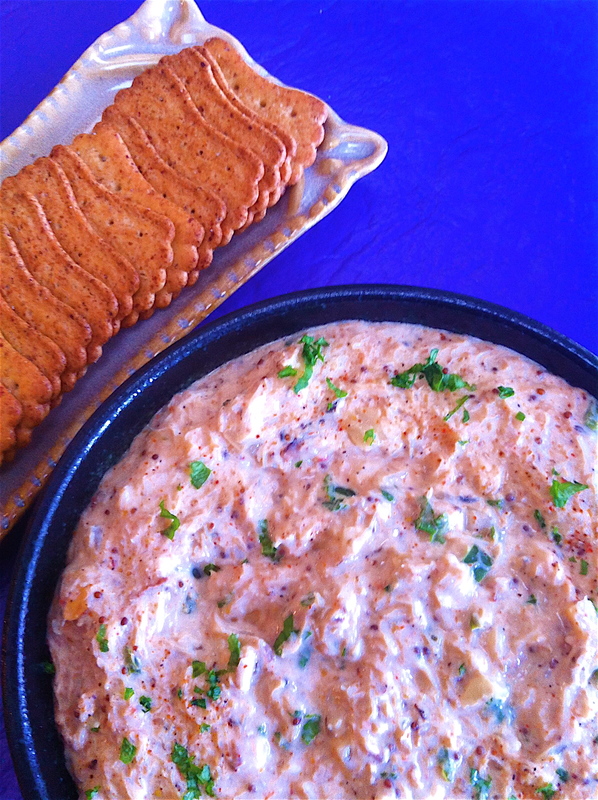 This Cajun Crab Dip is the perfect start. It’s creamy, cheesy, and spicy, with the faintest hint of Creole mustard. This isn’t your average crab dip. It’s loaded with flavor and a much healthier alternative to the original. If you are making the night before, follow all of the instructions up until baking. Cover and refrigerate overnight; let sit out at room temperature for about 10 minutes before baking. In a large saute pan, saute the onion, shallot, and garlic with a drizzle of olive oil until they start to caramelize. Add the crab meat and cook another 2 minutes. Reduce the heat to low and add the cream cheese, sour cream, and mayonnaise. Cook until the mixture is melty and creamy, about 5 minutes. Continue to stir while cooking to prevent sticking on the bottom of the pan. Remove from the heat and add the Cajun seasoning, cayenne, mustard and lemon juice. Mix well and season with salt and pepper to taste. Pour the mixture into a baking dish that is greased with cooking spray. Add the bread crumbs on top and bake for 25-30 minutes. Serve warm with crackers and vegetables for dipping. Previous postWhich Flavor Takes the Cake?